So let’s talk about a content marketing tool called Tribepro that claims to be able to get your website on the first page of search engine search results in Google and others in such a short period of time it’s actually kind of hard to believe. Now you may be one of those wanna-be marketers who is just dipping your big toe into the ocean of online marketing, or perhaps you are already an internet marketer who is already getting good results from your content marketing campaigns but would love to be able to automate your results and maybe just push a button and generate those thousands of backlinks you need to rank your content rather than having to go through the time consuming process of having to build the backlinks to your site using article marketing or reciprocal link exchanges. Let’s face it, in the world of online marketing there is so much to do, it seems you can never get it all done, so the very idea of a push-button automated back-link builder that could generate several thousand back-links to your content in a heartbeat and help to get it ranked is beyond exciting, it’s intoxicating. So when I first looked a Tribepro and read the typical glowing reports and testimonials, my wallet was already open and I had credit card in hand. I mean good grief if it can actually can do that stuff, who wouldn’t want it? So I decided to put TribePro to the test! So in this review I will examine the mechanics of how Tribepro works, and if in fact it does work, or if it’s just more internet hype designed to make a few bucks off of every desperate online marketer and then quietly disappear into the void when the results don’t show up. First things first, let’s talk some basic search engine optimization (SEO) strategies. Even if you rank because you are a master with on page SEO, you will still need to create back-links to your site to keep it there. This is typically done using an article marketing strategy. This is the third pillar of success in getting ranked, you now need to share your content and get as many social bookmark back-links as possible pointing back to your article or content. Well “Social Bookmarking Sites” abound on the internet, you have probably seen them or may even have an account already. Sites like Bebo, Delicious, FriendFeed, Google Bookmarks, Stumbleupon, and Digg, just to name a few, are social bookmarking sites. Social Bookmarking Sites came about as a convenient way to catalogue and store interesting websites for later quick retrieval by way of storing your info using “Tags” or “Keywords”. Most people who do a lot of surfing or research found that their “favorites” that they saved on their browser quickly became so overloaded that you could never find the site you have previously saved. So social bookmarking sites evolved to fill this need, and to give you an easily searchable web based archive where you could actually find all the websites you had previously stored. That of course was the original intent, however since Social Bookmarking creates an actual link on an external website that points to the original media, it in effect creates one of the most valuable commodities an online marketer is always seeking, a backlink. So that means social bookmarking can also be used to create SEO Backlink juice to your website. Now this is where the leverage comes in. Publishing and storing your bookmarks is possible through social bookmark posting and sharing services which allow you to use a single service such as Onlywire, to post out your bookmarks, tags, and comments to all of your bookmarking accounts and also to share them with friends. Posting services also allow you to share a post about an interesting site to multiple bookmarking sites where it posts information to your account page where it can also be accessed by others. So if I have accounts setup with let’s say 50 different social bookmarking sites and then use a social bookmark sharing service to push the same information and website link out to my 50 accounts at the same time, I have just created 50 social bookmark back-links! Now there are a number of these services on the internet but one we are going to discuss is called OnlyWire. This service will post your links to 50+ social bookmarking sites including Twitter, Facebook, and Linkedin all with one click of a button. TribePro is a Co-Op that uses the Onlywire service and when you setup an account, you can share the social bookmarks of others within the system by posting their links out to your social bookmarking sites, and in return they agree to share yours to their accounts. Tribepro is divided into“ tribes” or groups, and when you subscribe to the service you just join one or multiple tribes and then agree to sharing agreements with other members of the tribe. You do this by following the other members, just like you would do when building a subscriber list in Twitter. The difference here is that in addition to following other members, you can click a button and agree to “auto-syndicate” their social bookmarks. This means that if you auto-syndicate let’s say Betty, and then she posts an article on her blog about “Nutrition” and then shares it through Tribepro, it automatically gets posted out to not only her 50 social bookmarking accounts through Onlywire but also though your 50 accounts, so Betty gets 100 links rather than 50. Now imagine if you had let’s say 100 TribePro tribe members that were auto-syndicating your content, and you do a blog post and share it on Onlywire to your 50 accounts. Since your 100 tribe members auto-syndicate you, it would automatically go out to their accounts as well, creating as many as 5000 social bookmarking back-links with one push of a button. This can create a pretty incredible about of what is referred to as link juice (backlinks) that can in fact push your rankings up quickly on search engines. How Do You Get TribePro Followers? Now getting lots of followers and auto-syndicators is actually pretty easy in Tribepro. There have been several other reciprocal systems like this online based on the same “tribe” concept over the last few years, however one of the flaws of the other systems were that it was all generally based on whether or not someone actually liked your material, so you had to be a really good writer to make it work. 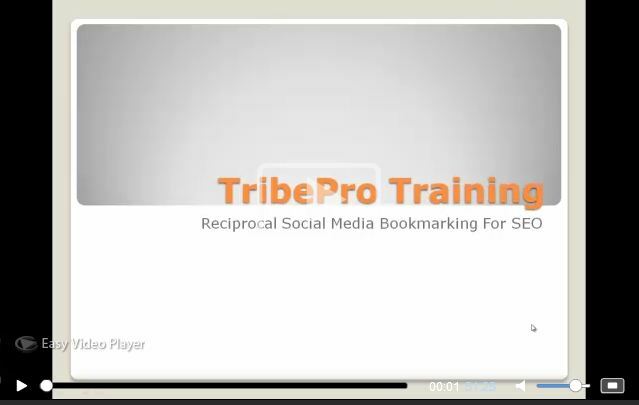 With Tribepro, it’s really all based on reciprocity not content. Look if you are pushing out bookmarks to dozens of social bookmarking sites that you would probably never use anyway, and that no one is probably ever going to go to anyway, does it really matter what kind of content you are storing there as links? So when you enroll in a tribe and go follow and auto-syndicate 100 other tribe members you will usually find that about 99% of them immediately follow and auto-syndicate you back. You now have a tribe working for you and killer leverage to boot. TribePro Free Account – This is a waste of time since with a free account since with the free account you don’t have the functionality to auto-syndicate and that is the whole purpose of the system. TribePro Pro Account - $79.97/month. This gives you full functionality and also allows you to start your own tribe. This is a great way to generate additional leads through the system since when someone joins your tribe, it allows you to build a list of members for your marketing and recruiting purposes. The system is pretty easy and has lots of training videos so you can be up and running pretty quickly. However here are some operating tips that will shorten your learning curve pretty dramatically. How Many Tribes do you need to Join in Tribepro? You do not need to Join Multiple tribes, just start with one, you can join others later. Tribepro works on a point system, you have to have a certain number of points in your account (10) before you can post your content out to the tribe. Don’t worry about this, since if you go into the system and setup some followers and auto-syndicate them on day one, you get points from them every time they push an auto-syndicate piece of content through you, so you will find your account overflowing with points in a few days. Posts & Content is Not Tribe Specific: The recent posts you will see by other members when you log into Tribepro are not tribe specific. That means that if a piece of content is posted by a member of one tribe that post is then shared with all tribes. Post only once to Tribepro. Once you submit a post you do not need to repost it in other tribes, the same post goes to all. Tribepro will not let you post the same content’s URL more than once. You can however post the content more than once if you use different URL’s such as posting an article on your blog and then also posting it on Ezinearticles.com or on your online marketing system URL such as My Lead System Pro’s Articles Directory. Always share to your own Onlywire account first: If you are in the TribePro system when you post a content link, remember to use the OnlyWire share button (under your photo) to share to your own OnlyWire account first. I recommend that you do not reciprocal share to your Facebook and Twitter Accounts. Since your are pretty much doing blind reciprocity in Tribepro and have no idea what links your auto-syndicators are pushing though your accounts you don’t want to take content sensitive social media accounts such as Twitter or Facebook where you want to control the content and flow of the media and blindly dump a lot of random content on your followers or friends. Keep your auto-syndication accounts limited to just the pure social bookmarking sites where it does not make any difference. Auto Syndicate only those Tribepro members who auto-syndicate and share to at least 10 to 15 sites. The ones that share to 25 to 30+ sites are the best because they give you the most leverage. Do not Auto Syndicate those who use the free service. There is really no benefit to your following or auto-syndicating someone with a free Tribepro account. Add new followers and auto syndicators daily. The best approach is to search currently posted articles in Tribepro and see who has a lot of shares and then if they fit the auto-syndicate rules about just click on their follow and auto-syndicate buttons to add them to your group. You will find that they will pretty much do the same back to you within a day or so. Onlywire - Setup Social Bookmarking accounts will all providers (except for Facebook, Twitter, and LinkedIn). Onlywire currently supports about 50. The more sites you submit to the easier it will be for you to find auto-syndicators to push your content. Setup Tribepro Auto Syndication – be sure to setup this function because this is what will draw followers and auto-syndicators to you. Set limits for postings – Some Tribepro members have bad posting etiquette and will go into the system and post 10 articles at one time. Since you have posting limits with Onlywire this kind of drains your account so set your limits at 5 a day from any one member. Setup Auto Submit for Blog Postings – You can setup Tribepro so that every time you post an article to your Wordpress blog that it automatically posts it to Tribepro and auto-syndicates it without you ever having to go to the Tribepro system. Great automation! Your Youtube content – Many times Youtube.com video content will come up faster on Google or Bing first page results so always push this content through Tribepro to give it a boost. Easy Video Player content (This is a great tool if you market online, and you can rank with this video content) I usually always post my video content to both Youtube and Easy Video Player. EzineArticles.com content – EzineArticles.com is pretty much the biggest article directory on the internet and has a huge amount of internal search traffic. You should always be posting your blog posts here after you put them on your personal blog. So there you have it, I guess you can pretty much guess that it works, and works well. 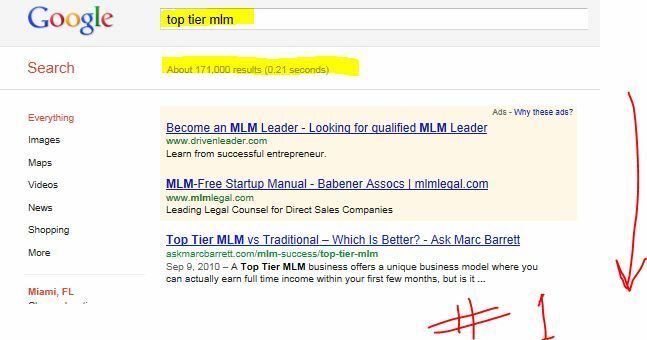 I have lots of fist page rankings on the search engines such as Google, and Tribepro is an important part of my marketing arsenal. 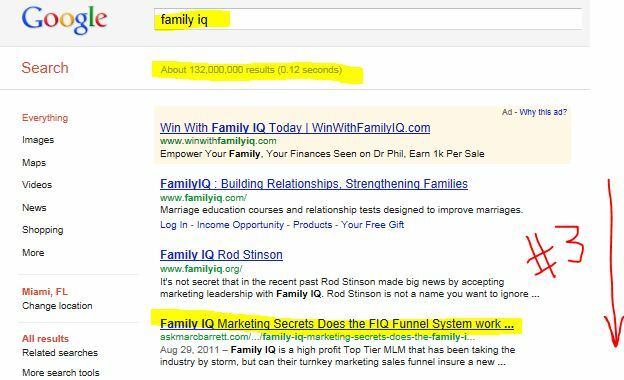 My standard approach is of course to follow the core strategy of optimizing for “On Page SEO” factors first and then next posting to Tribepro followed by an article marketing campaign to seal the deal, however I have see my content hit the first page of the search engines many times just based on the “on page” factors and Tribepro.